You are currently browsing the tag archive for the ‘Hawks’ tag. A lie in – much appreciated after being awake from 4am to 5am dealing with the new flora of bacteria that are now living in my intestines. Best just to say that we have had a dodgy introduction! Unfortunately the local primary school were having their English exam today so couldn’t take us to the tortoise breeding centre. We did call into their school on our way though to say hello. The 6 year old students and their teacher were very welcoming, singing us songs and making us feel at home. The girls had brought some Welsh cuddly toys and the Amys had brought books and colouring pens, which were appreciated. Sure enough there were marine iguanas waiting to cross the road! Amazingly they have had time to evolve some road sense. I’m not saying that they looked left and right before crossing or that there was an older one with a lollipop to help the young ones cross! But when a vehicle did come along they ran away from the road or sped up if already crossing. I had just switched off the video camera when a dog ran past on the road. Luckily I managed to get it back on again as they raced back towards the bushes for cover. Its got to be one of my favourite bits of video footage of the whole trip. 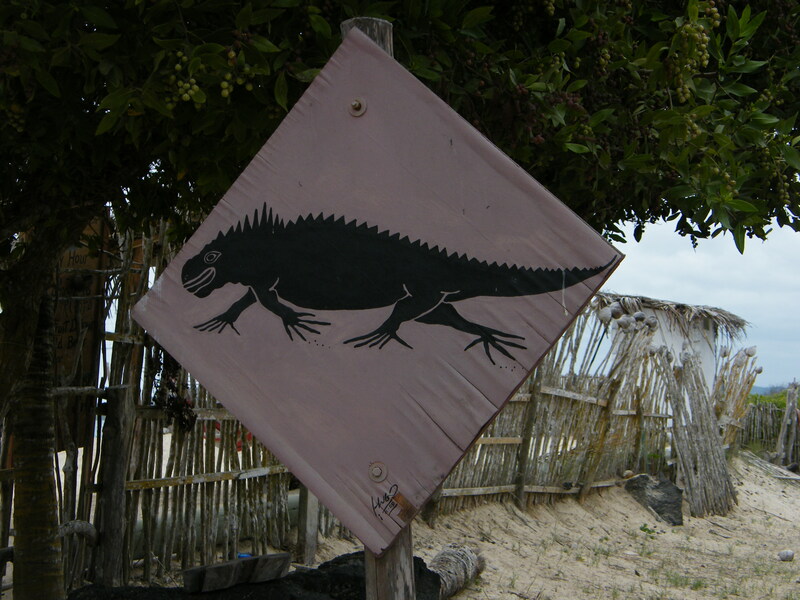 Unfortunately introduced animals are the main predators of marine iguanas, but at least this shows that the native fauna are evolving to be scared of them.